I made this Date-Night Spicy Sausage Stuffed Ravioli solo, but I definitely think the effort is better split between two people… So make a date night out of it or give it a whirl with a friend or roommate. I am making use of fresh, seasonal ingredients here, so I skipped any type of labor-intensive prep of the vegetables and instead opted to let their natural flavor be the star of the show. The ravoli takes some doing , however, so after the sausage and onions are cooked then take a pause to make the dough and get them prepped before starting with the zucchini and tomatoes. 24/7 pastured means the chickens are not outside for just a percentage of the day, but instead spend the majority of their lives under the sky with shelter provided from the elements and during rotation (see rotational grazing, below). Humane conditions where the birds are free to roam, fly, flock, and forage a natural omnivorous diet for themselves are the opposite of the conventional “grow-house” technique of overcrowding which necessitates practices such as debeaking to prevent cannibalism, feather pecking, aggression, and other stress-related behaviors common in close confinement. Antibiotic-free commitments from Pasturebird and other responsible livestock operations contribute to decreasing the antimicrobial resistance crisis, which is an issue of such concern to the international and scientific community that global leaders are convening at a United Nations General Assembly on the topic in September. Nutritional superiority is an extraordinary side-effect of minimum human interference in poultry production, because Mother Nature knows best. Environmentally regenerative rotational grazing practices combat the erosion and infertility that can be the unfortunate result of continual grazing1. By rotating the flock to a new stretch of grass daily, the previously-grazed areas have 90 days to recover, and the chickens are served a fresh forage area. The bottom line is that healthy food = healthy humans and a healthy planet. Pasturebird takes pride in offering farm tours and maintaining a gold-standard level of transparency, because the industry is infamously rampant with misleading claims and exploitation of consumer misinformation regarding labels. So take a look at Pasturebird—which ships nationwide and offers subscriptions—when choosing your sausage for this Date-Night Spicy Sausage Stuffed Ravioli. I had a great time mimicking the herbal spiciness of the sausage itself with the fresh herbs and chili flakes as garnish. It’s the first time I have attempted homemade ravioli, and I found a recipe for four ingredient cassava-flour ravioli that I used with good results, if you’re in the market to keep it grain-free. Enjoy! Heat a medium skillet over medium heat. Cut open the sausage casings, and add the sausage filling to the skillet. Cook, breaking up any large chunks with a spoon or spatula, until no longer pink. Remove from the heat and set aside. Cook the sliced onion in the same pan, scraping up any browned bits, until they are softened and caramelized (add a teaspoon of olive oil if the skillet becomes dry). When the onions are almost finished cooking, add the minced garlic and stir with the onions. Remove from the heat and set aside. Add the second teaspoon of olive oil, and cook the sliced zucchini and tomatoes until soft. Remove from the heat and set aside. To make the ravioli dough, combine all of the dough ingredients and knead by hand until a ball can be formed. Sprinkle a little extra cassava flour on a piece of parchment paper, and roll the dough out until it is approximately ⅛ of an inch thick. On one side of the dough, spoon ½ to ¾ teaspoon of the filling in little mounds, spread approximately 2 inches apart. Fold the other half of the dough (without the filling) in half, covering the filling mounds – use the parchment paper underneath to help fold it over if it is too fragile to do without assistance. Bring a medium pot with a few inches of water in it to boil. Press down on the top layer of pasta just slightly to show where the filling mounds are, then using a ravioli cutter, press down gently, with the filling centered in each “stamp”. Drop the cut ravioli into the boiling water. Allow the ravioli to cook until they float to the top, a minute or so. Use a slotted spoon to remove them, gently shaking off excess water and transfer to a plate. 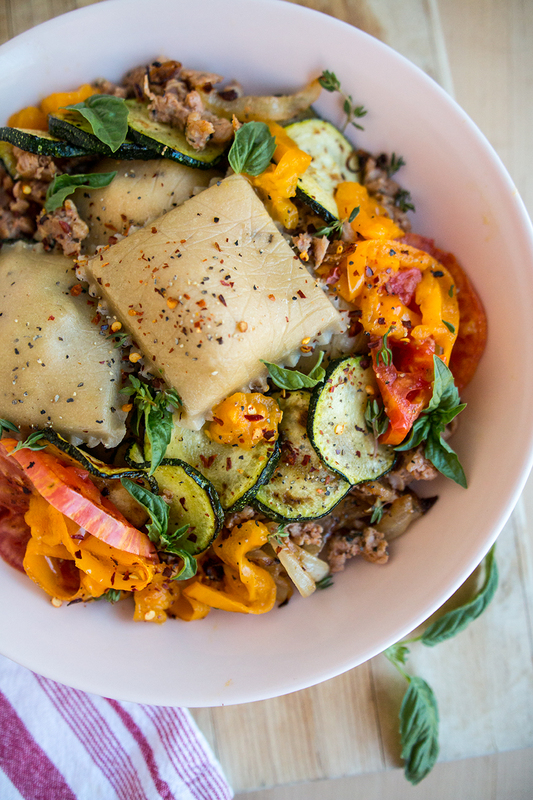 Arrange the ravioli, tomatoes, zucchini and any extra sausage onion filling in serving bowls. Top with fresh herbs, freshly-cracked black pepper, coarse salt and chili flakes. Serve warm. This looks realllly good! My boyfriend would definitely be a happy man if I made this! Wow that looks stunning! So delicious and almost too gorgeous to eat! This looks delicious and healthy! I’m currently loving anything with zucchini. Can’t beat it during summer! Oh MY! I need this in my menu rotation! That cassava dough looks so legit! That’s looks so delicious! Color is everything. You do eat with your eyes, first. Fantastic! I am going to have to try the cassava flour for ravioli! I have used it for tortillas and biscuits and it works great! I’m drooling. This dish looks so good and you are super fancy for making your own ravioli! Aw, thanks! But it’s easier than it looks. Yum I am DROOLING over here. This sounds so good. I love how you styled it too! You had me at ravioli… looks amazing! This looks delicious! The presentation is stunning too! I love ravioli and can only imagine how delicious this is! Oh my goodness, this looks like heaven on a plate!! Love ravioli!! This looks amazing!! woah! I love how beautiful it looks, plus I imagine its delicious! My husband and I were just talking about this kind of ravioli the other day 😀 Can’t wait to try this! Cassava flour? Or sausage stuffed? This looks insanely delicious!! Wow! So pretty too. I love food with lots of colors. Wow that looks amazing! Love the colors on that plate. For sure. Always gotta be clean-eating friendly!